The excitement surrounding the release of Sierra Nevada Brewing Co.’s annual Oktoberfest lager can be felt across the country. The brewery has even redesigned their entire site to commemorate the release, including a traditional Oktoberfest pattern and German navigation options. Looking around the site, you’ll learn a variety of information about the history of Oktoberfest and learn why this beer—which is a collaboration with Brauhaus Riegele of Augsburg—is so important to Sierra Nevada. After you click around a bit, you might notice a visitor has popped in the middle of the navigation bar, meet Kenny. Kenny is the hero in a game Sierra Nevada had created in honor of the beer. Basically, the Oktoberfest celebration is in trouble—there isn’t nearly enough of Sierra Nevada’s Oktoberfest lager—and it’s up to you and Kenny to save the day collecting ingredients to brew more. 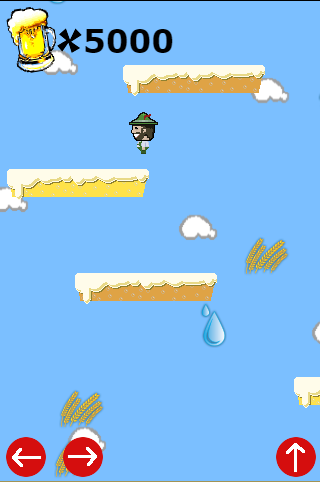 You guide Kenny to jump around like a little brewing Mario and collect malt, hops, water and yeast. Sierra Nevada’s Oktoberfest game is a prime example of how our ever-expanding digital culture is invading every industry, including craft beer. There are a million ways to catch someone’s attention, and Sierra Nevada definitely has the attention of craft beer enthusiasts. This game might be a new experiment for them to attract another kind of customer beyond who they normally reach. The game is not advertised anywhere on the site. The user has to be actively looking around the site (and hopefully learning about the beer) for Kenny to appear in the bar at the top of the page. Sierra Nevada has a very well established fan base of craft beer drinkers, and they’re looking at ways to increase their appeal and differentiate themselves from other breweries both for their current fans and hopefully some new ones.